To begin we will list definitions of what a triangle is and some of its characteristics. Triangle: geometric figure consisting of three points joined together by segments. Height of a triangle: a line segment that starts at a vertices forming a right angle with the opposite side. Base of a triangle: The side of the triangle with which the height forms a right angle. The perimeter is the total length of the sides of a triangle. To find the perimeter you must add the length of all three sides of the triangle. The interactive triangle allow you to move points or segment around. It automatically adjust the value of angles, segments, perimeter and area. 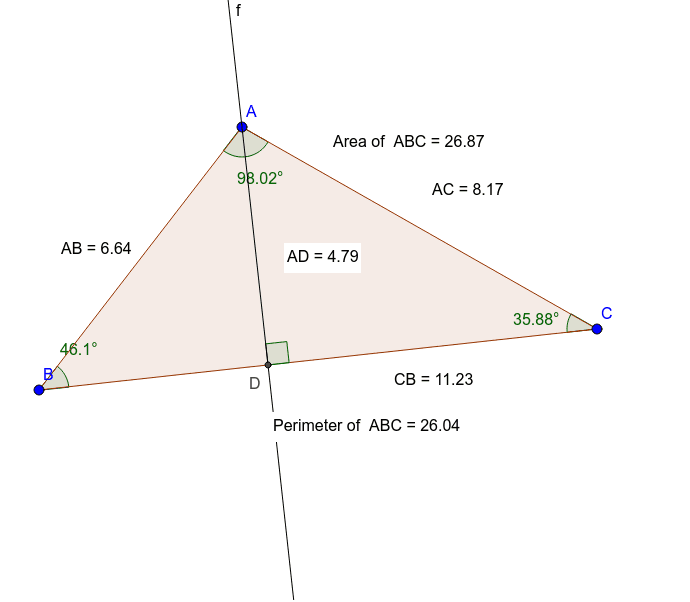 The terminology AB, BC, CD refers to the length of the line segment from one point to the other. Notice that when the angle at C or B is obtus (more than 90 degrees) the height at A lies outside of the triangle. This may cause certain difficulties when calculating the area of the triangle. Here is a tutorial video that will explain and help you to find the height and base of any triangle.